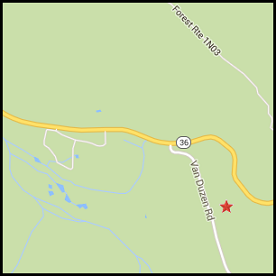 Located just off of Highway 36 on Van Duzen Road, our Mad River facility is our company headquarters. When Southern Trinity Health Services and Southern Trinity Area Rescue were first established, this was our original location just north of the popular Ruth Lake. Surrounded by hundreds of miles of Forest Services roads and seasonal hunting grounds, the area is prime for vacation homes and camping areas for those who live on the coast or for the hardy folk who make the rural area their home both recently and for multiple generations in what is considered frontier territory. The clinic offers both dental and medical services and is up to date with modern technology and a large emergency medical treatment room for the situations that need urgent support as well as capable of providing some urgent medications. Home of Southern Trinity Area Rescue (STAR), any emergency calls made within our 1250 square mile radius of coverage is routed through this facility through our volunteer dispatchers as necessary and at least one of ambulances is kept in Ruth as well as at the clinic to ensure the promptest response time possible.